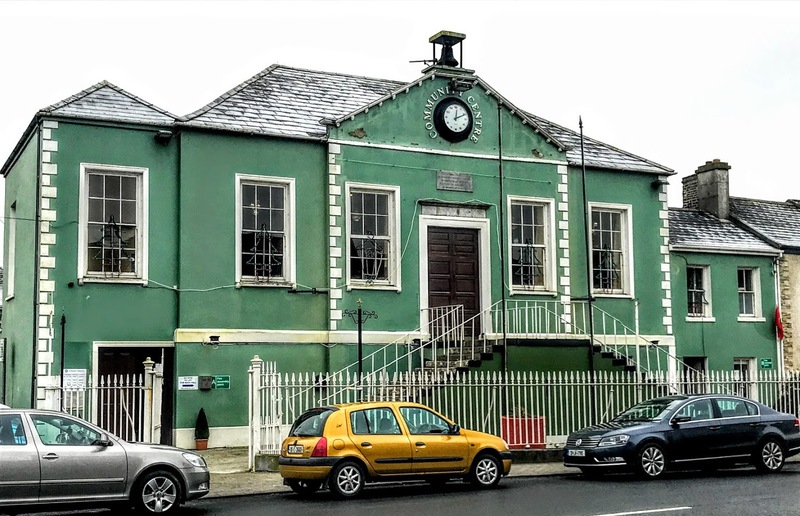 The community centre in Rathkeale, which has served in the past as a courthouse and a Bridewell, dominates the Market Square in Rathkeale, and with its green paintwork and its very visible clock it is a landmark building in this west Limerick town. In 1836, Rathkeale was the largest town in Co Limerick. It had a large constabulary barracks, a courthouse, a gaol, a flour mill and a fever hospital. 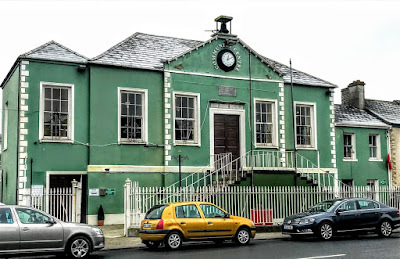 A new courthouse and Bridewell were built in Rathkeale in 1843, probably by Michael Fitzgerald, drawing on plans designed by the Limerick-based architect James Pain. In that year, an architect named Fitzgerald won the contract for building same to designs by James Pain. The architect and builder Michael Fitzgerald, who probably lived in Limerick, designed the bridewells at Ennistymon and Tulla, Co Clare, and was responsible for alterations to Ennis courthouse in 1825, and for minor works at Ennis gaol in 1826. He is probably the same Michael Fitzgerald who worked on several Church of Ireland parish churches in Co Limerick, Co Tipperary and Offaly, carrying out minor works at Kildimo, Co Limerick, in 1813 and 1814, supplying the plans for Ballymackey, Co Tipperary, (1817), and Dunkerrin, Co. Offaly (1817), and building Modreeney, Co Tipperary (1826). A ‘Michael FitzGerald, Architect’ voted for John Prendergast Vereker in the Limerick parliamentary election in 1817. In 1843, a Mr Fitzgerald, ‘architect,’ won the contract for rebuilding the court house at Rathkeale, Co Limerick. The four-bay, two-storey courthouse and Bridewell in Rathkeale was built as a detached building, with a gabled breakfront, and flanked by wings, each with a hipped roof. The court was on the first floor and the prison below. A cut limestone flight of steps leads up to the entrance. The cut limestone plinth boundary wall has cast-iron railings and there are circular-profile cast-iron piers at the entrance and double-leaf cast-iron gates. Petty Sessions were held in the courthouse on alternate Thursdays and Quarter Sessions sat in January, April, July and October. There were proposals were in the early 1970s to demolish the building. But this provoked strong local resistance and the courthouse was developed by Rathkeale Community Council as a community centre. Reconstruction work began in 1977 and the hall was made available in 1980. Although the building was in good structural condition, the entire interior had to be gutted, and building and refitting became a complex project. A new entrance was opened at ground level and is now a prominent feature of the building. The original old cells for prisoners awaiting trial had been later been used by the administrative staff of the County Council. This area underwent considerable change with the provision of meeting rooms and a kitchen for Meals on Wheels, the Senior Citizens Centre and Civil Defence. The old clock that had adorned the façade for more than a century could not be restored, but its replacement provides an excellent substitute. FAS contributed to a large extent and voluntary help ensured the completion of the work when there was a shortage of local skilled trades. President Patrick Hillery formally opened the Community Centre in 1983.